Slimed at the BOOMco. Blaster Challenge! Stephen Curry and Rudy Gay Have a Blast with BOOMco.™ | Mattel Inc.
Today, professional basketball players Stephen Curry and Rudy Gay participated in the BOOMco. Blaster Challenge, as part of Mattel's campaign sponsorship of the Nickelodeon Kids' Choice Sports Awards. The two sports powerhouses took their skills off the court, competing head-to-head testing their precision and accuracy with BOOMco., an all-new line of blasters from Mattel with darts that actually stick to the target. 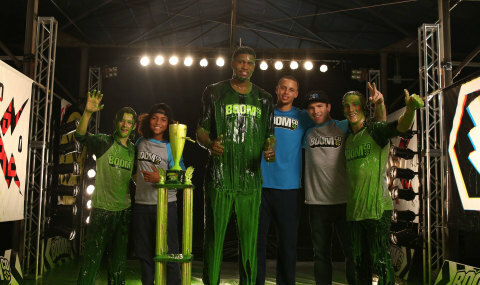 At the end of three challenges, Rudy Gay led his team to sweet slimy victory! Check out the BOOMco. Blaster Challenge and all the fun at www.boom-co.com.